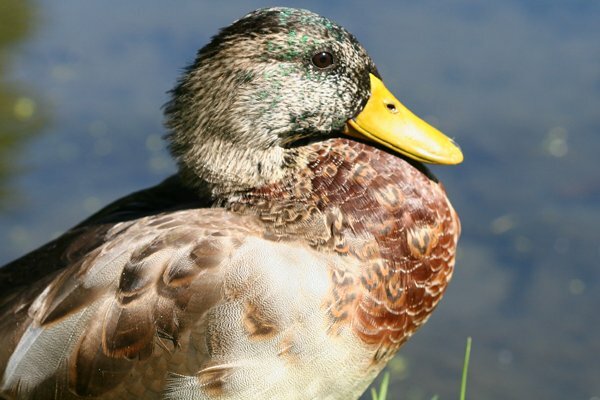 Years ago, Charlie Moores coined the colorful term “manky mallard” to describe the motley menagerie of feral and domestic mallards (If you’re wondering, manky means many things in British parlance from dirty and disgusting to inferior and worthless.) Here at 10,000 Birds, we’ve always celebrated odd ducks, which means manky mallards feel right at home! 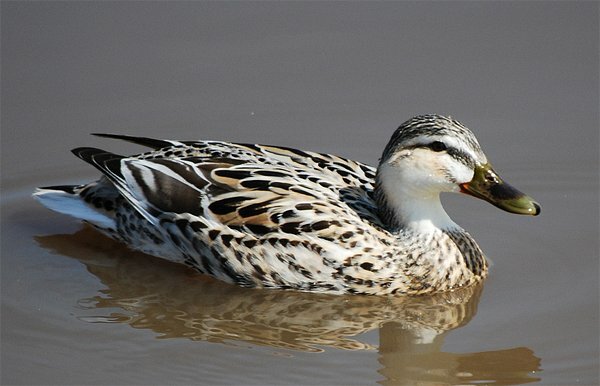 What are the different breeds of domestic duck? 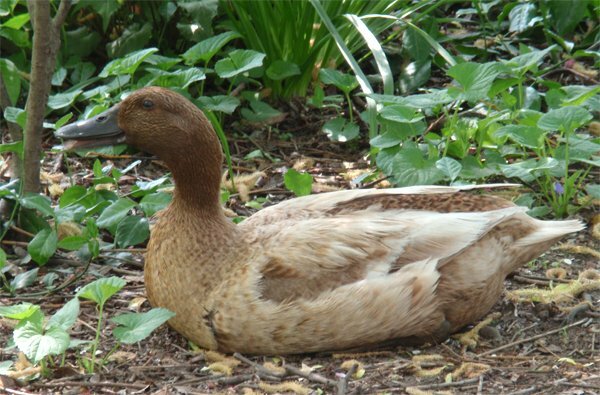 Abacot Ranger or Streicher ducks are often referred to as hooded rangers because of the buff feathering of the hen’s head. The ranger drake sports a brown cowl as well as a dappled chestnut chest. Both have white bodies. 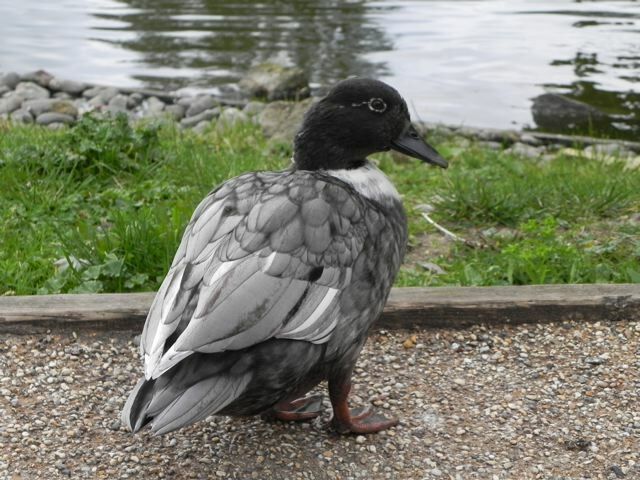 Ancona ducks are among the mankiest of the domestic ducks with mottled monochromatic plumage. Anconas forage actively despite their flightlessness. 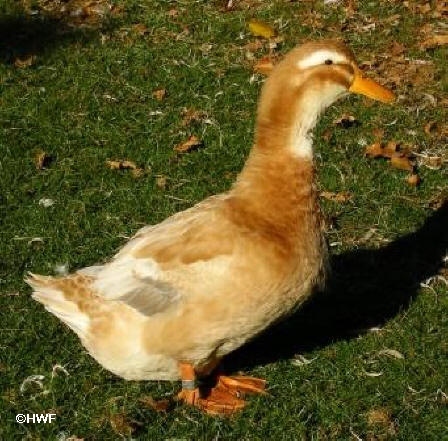 The Aylesbury duck was the original white farm duck of Europe, before the Pekin toppled it from its lofty perch. Aylesbury birds are pure white with orange legs, but distinguished from Pekins by their pink bills. Buff Orpington ducks are drab ducks named for the buffy coloration of the females. The male has a brown hood and buff body. Buff Orpington also describes a breed of barnyard chicken. 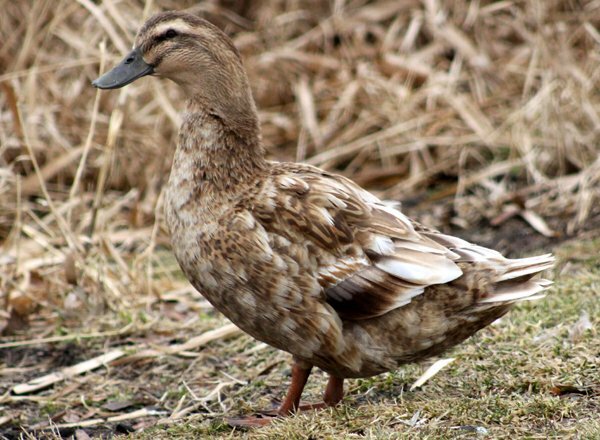 Call ducks are quite compact, smaller than any other domestic and wild mallards. 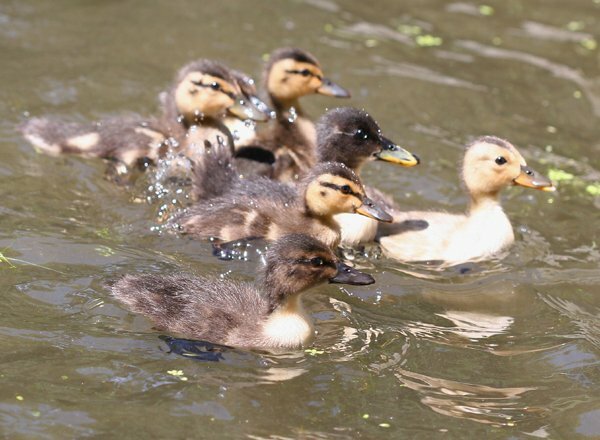 Thanks to their modest proportions, these mini-mallards are better flyers than other mankies. 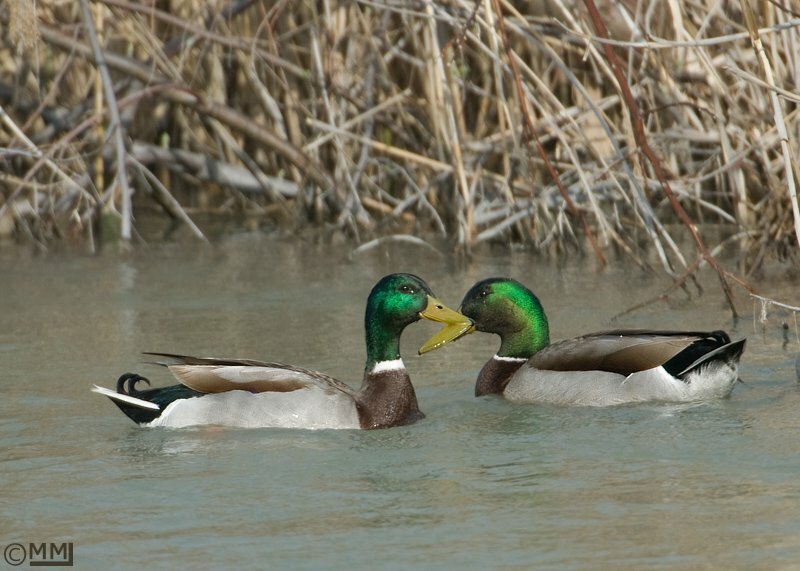 The Cayuga duck takes the striking metallic green plumage of a wild mallard drake’s cowl and wears it from tip to tail. In fact, Cayuga males and females both flaunt this dramatic feathering. 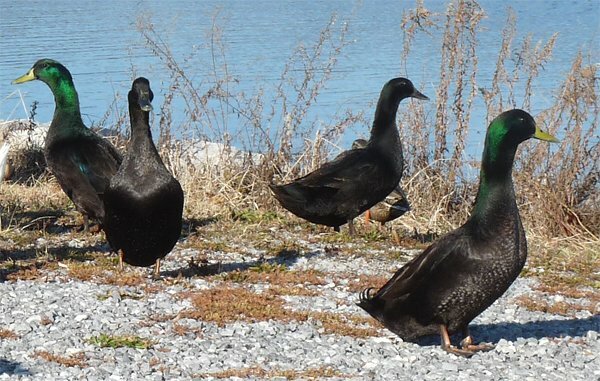 Interestingly, the entire breed of black ducks, as Cayugas are called, can be traced to a single pair raised in Duchess County, NY. 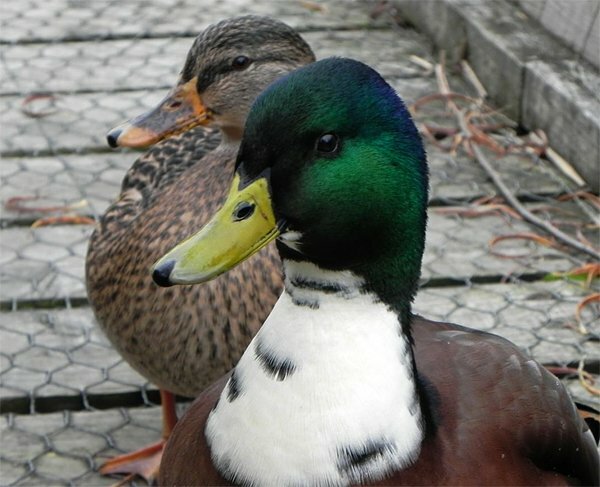 Duclair ducks are classic manky Mallards with green heads, white bibs, and solid brown, black, or even blue-gray bodies. The distinction between Duclairs and the rarer Pommeranians is lost on me. Indian Runners appear attenuated, as if someone stretched a regular duck on a rack. These upright feathered bowling pins come in a variety of colors. 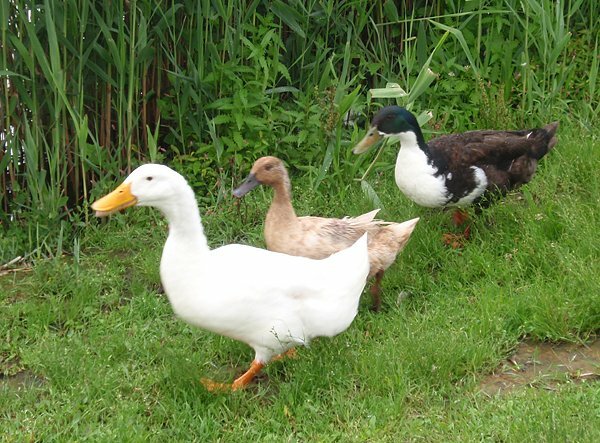 Khaki Campbell ducks, named for both their primary color and the original breeder, bear a superficial resemblance to wild Mallards. However, their oddly-shaped, heavy bodies and drab plumage give them away. Females have distinctive dark heads and bills. Magpie ducks , much like actual magpies, make the scene in brilliant black and white, although variations exisit. Magpies are distinguished from Anconas by their more predictable patterning, which includes a smart black tonsure. 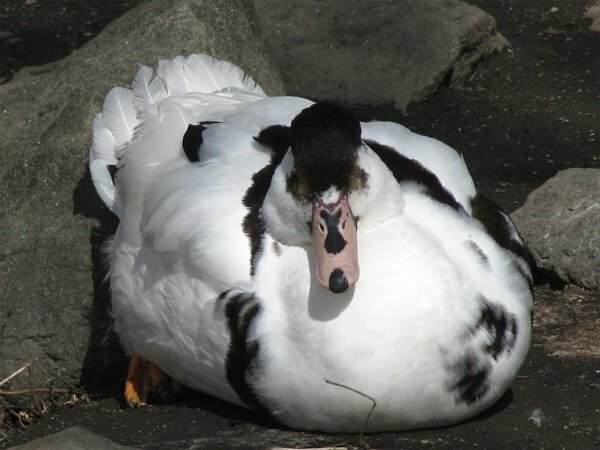 Magpie ducks don’t bulk up as much as many domestic breeds do. 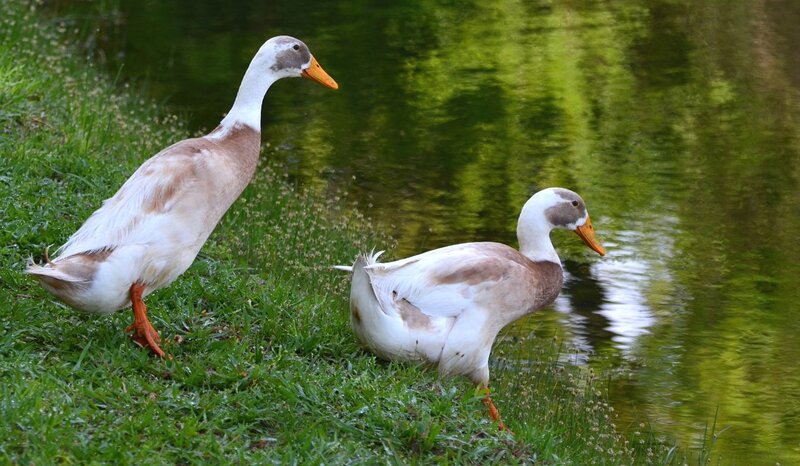 Pekin ducks embody exactly what most people envision as the classic domesticated duck. These barnyard beauties have large pure white bodies with orange bills and feet. This photo © Mia McPherson of on the wing photography (used with permission) shows how a Rouen differs subtly from a wild Mallard: look for overall beefiness, a sloping forehead, and almost perfect plumage! 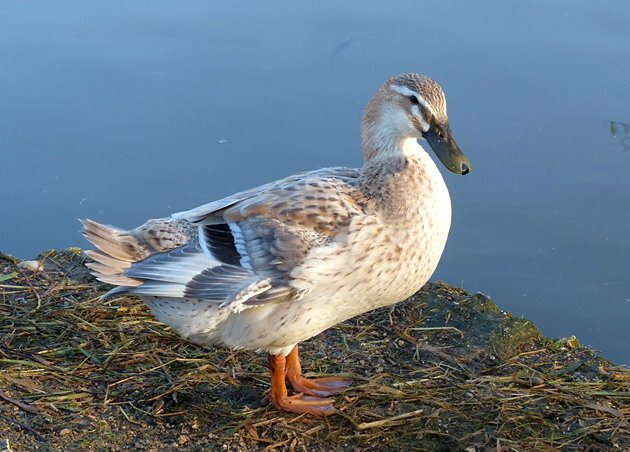 Saxony duck drakes look like large, faded wild Mallards but the females and young are far more fetching in their fawn-colored plumage with white facial markings. Swedish ducks are heavy bodied, bibbed birds that appear in different shades of blue, gray, and black. 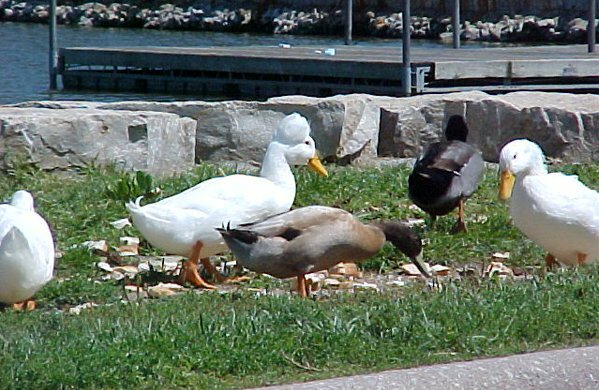 ARE CRESTED DUCKS A SEPARATE BREED? 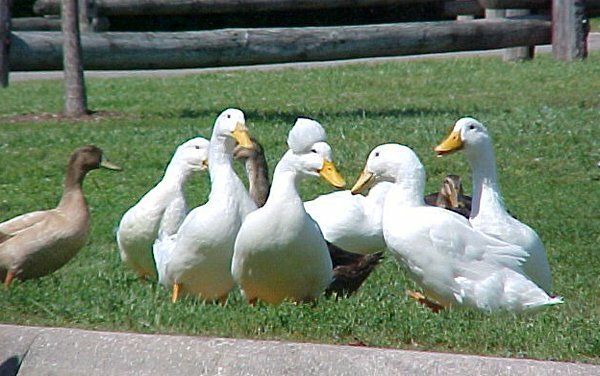 One of the most fascinating finds when watching domestic ducks is the odd duck flaunting what appears to be a large powder puff, cotton ball, or afro on its head. These are called Crested Ducks and are sometimes considered their own manky breed. However, the crest is actually the manifestation of a mutation; the crest is formed from fatty tissue that seeps through a gap in the bird’s deformed skull. Sounds grisly, but the mutation clearly isn’t fatal, though it can lead to health and balance issues. At least it looks cool! 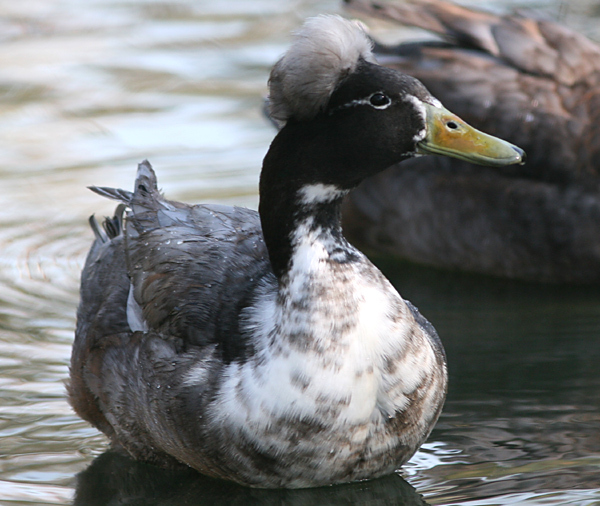 I spotted this Crested Blue Swedish duck at Kenneth Hahn State Recreation Area in Los Angeles. Just because a duck looks odd doesn’t mean it’s manky. This Mallard, captured by Mike Fuller at the Arundel Wetland Centre in the UK, flaunts a bib. 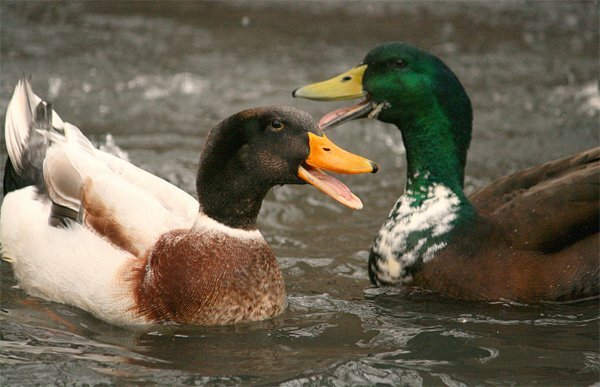 However, the bib alone doesn’t make the duck domestic as bibs do occur very rarely in wild Mallards. On the other hand, the drake’s bulk suggest a certain degree of mankiness. This striking female Mallard, snapped by Renee R at Richfield Lake in Richfield, MN, certainly stands out. But is she manky? She’s probably just leucistic, which means she has reduced pigmentation. The faded fellow above, photographed by Corey, is a wild Mallard enduring a total eclipse of the plumage. 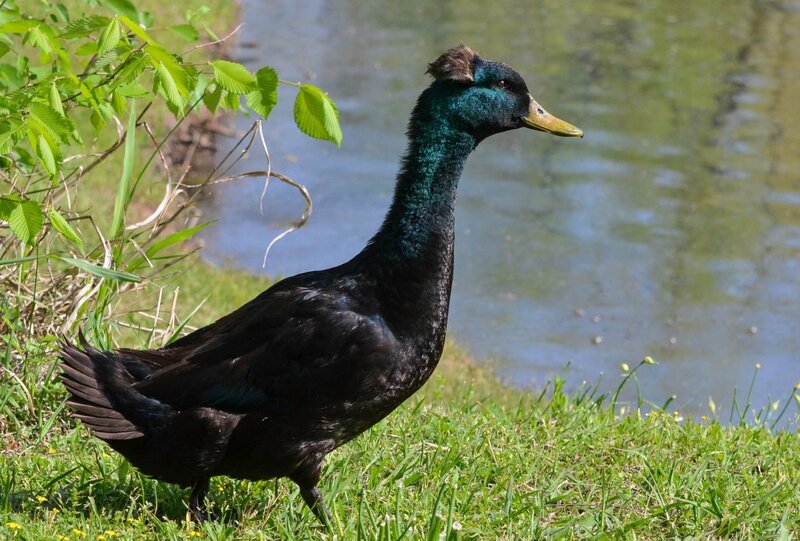 Eclipse plumage is a phenomenon mostly associated with male ducks wherein they moult into a dull, female-like plumage once the breeding season is over. Manky mallards are most certainly born that way, as mankiness manifests from the breeding and interbreeding of domestic mallards. If you’re looking for proof, feast your eyes on Corey’s analysis of Mallard Ducklings: Manky and Not. IS IT EVEN A MALLARD? 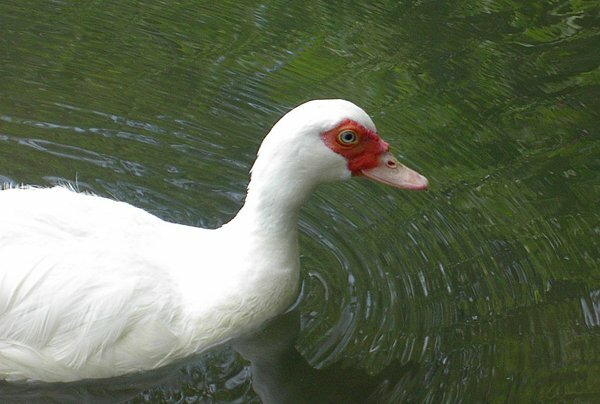 If you see a duck like this one I captured many years ago in New York’s Central Park, you’ve encountered not a Mallard, but a domestic Muscovy Duck. Manky Muscovies are another story entirely! 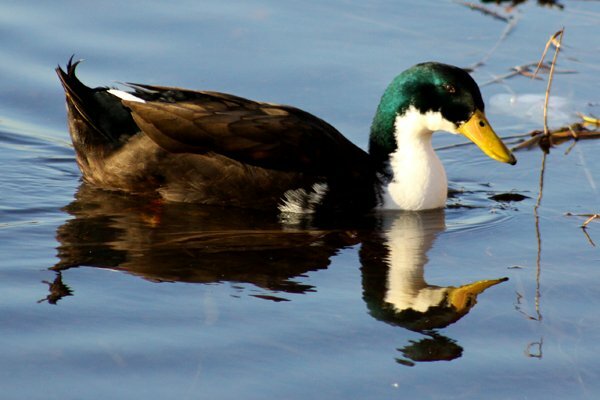 If you have great photos of manky mallards you’d like us to add to this gallery, send them to mike AT 10000birds DOT com! Species Mike? Subsequent Muscovy reference notwithstanding surely breed/type would be more accurate. Definitely, Tai. That was a big oversight on my part. Thanks for the correction! Mike, this is a lovely post, indeed. A small remark: the wild male on the third photo from above has a bit of a pale breast and lacks the white collar, so it might have some mankyness in it, too. I saw two manky ones at NY Botanical Garden in Bronx a couple weeks ago. 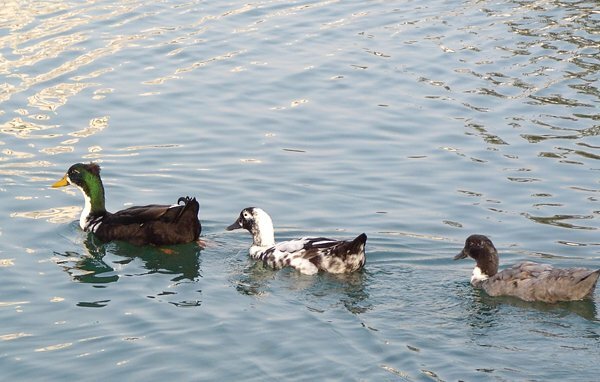 Those were cow color patterned (patchy black and white) and swimming with bunch of Mallards. If I had known that this article was coming, I would have kept my photos to send one to you, Mike! Cow-patterned suggests the breed known as Magpie. I see Manky Ducks all the time at Flushing Meadows Park. I didn’t know they had names. Thank you. Now, I can stop calling them ugly ducks and assuming they look weird from the polluted water. I’ll have to take a cheat sheet with me, that’s a lot of manky duck breeds! Oh good, at first glance I thought you said Queens birders may be mutants. I would then have to put my New Jersey Audubon hat on. i have a male black east indian/labrador duck, and a female cayuga, & wondered if it were possible for them to mate?! can a call duck sized male mount a good sized cayuga? OK, I’ve got a problem. 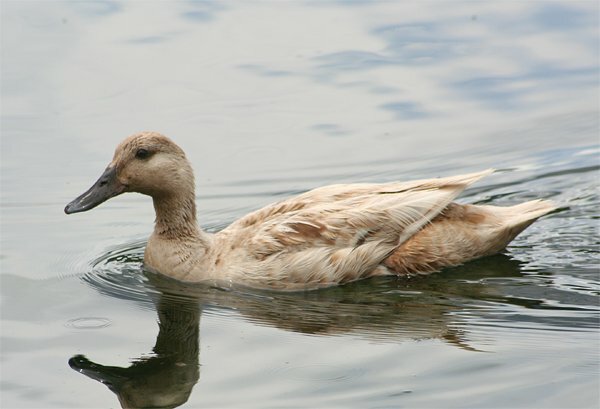 I have a pet duck, and I can’t figure out what type of breed/species/hybrid whatever he is. and also, no matter what time of the year it is, he always retains some mottled brown plumage on his stomach, breast, and neck (completely mottled on the belly though) he also lacks the white neck ring and has a very green bill, not greenish yellow, but quite literally green, with a brownish tinge to it. so basically, he has a mostly chestnut/rufous breast, grey wings coverts with a brown and black wash, brown primaries, grey-brown wings, purple/green-blue speculums, a mostly green head with brown flecks, a blackish brown tail, green black upper/undertail coverts and back, almost completely solid brown scapulars, grey flanks, brown eyebrows, and a mottled stomach. his legs are the typical orange color, and his bill is that weird gang-green color. he also has brown eyes. (not that it matters) during the summer months till about November, he looks almost exactly like a female mallard other than dark green-black feathers on his nape, crown, and a stripe running from his bill to well past the eye. also his tail and back never changes, nor his wings, speculums, or stomach. so, does anybody know what kind of duck he is? and if so, how long he’ll live? Oh my god, i see soooooo many wrong things here, i dont know were to start! Answer: This is NOT a Orpington duck. I think its a cross. Answer: The white one is not a goose! Its a duck! i think its a peking duck, white champell duck or aylesbury duck. 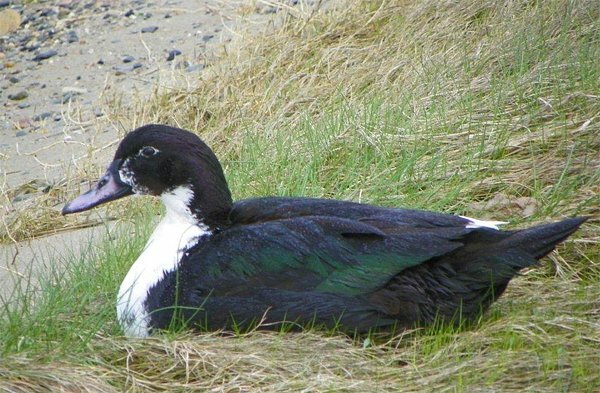 Answer: This is a Muscovy hybrid, look at the pink bill! Answer: Rouenducks are not so small! They are 3 times bigger than mallards! GOOGLE. Answer: Not a blue swede, i think call duck x mallard or something like that. Its to small for swedish blue. Answer: Again, Muscovy hybrid, look att the bill. Thanx for sharing your outstanding illustrations above! so basically, he has a mostly chestnut/rufous breast, grey wings coverts with a brown and black wash, brown primaries, grey-brown wings, purple/green-blue speculums, a mostly green head with brown flecks, a blackish brown tail, green black upper/undertail coverts and back, almost completely solid brown scapulars, grey flanks, brown eyebrows, and a mottled stomach. his legs are the typical orange color, and his bill is that weird gang-green color. Several of these photos and descriptions are incorrect. Sad to see that its still like this so many years after the article was made. Would you mind sharing which ones you think are incorrect, Daniel?